Four more lawsuits have been filed by Beverly Hills Police Department employees who claim they were marginalized, faced retaliation, or were denied workplace protections by the city and its police chief, Sandra Spagnoli. 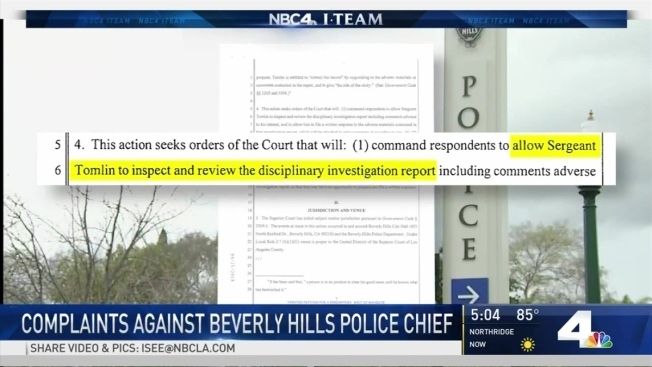 To date at least 10 Beverly Hills police employees, including a captain and two lieutenants, have filed legal complaints saying they've lost pay, benefits, and professional standing as a result of the chief's actions. One of the new cases was filed by Officer Anne Marie Lunsman who said she missed out on promotions and special assignments as a result of an alleged "hostile work environment." Lunsman claimed she was passed over because of her gender, age, race, and religion. Another of the cases was filed by Sgt. David Tomlin, who said he was denied access to review an internal affairs investigation file, that he said had cleared him of wrongdoing. A third lawsuit was filed by a police department parking enforcement supervisor, Gregory Routt, who said he was the victim of racial discrimination. The fourth case was filed by a civilian police business manager, Tania Schwartz, who said she was marginalized and lost merit pay after she warned Chief Spagnoli about the irresponsible use of public money. "On a regular and continuous basis Plaintiff warned or complained that Chief Spagnoli was not following the legal requirements of the municipal code, financial rules, or regulations," Schwartz's complaint read. "Spagnoli would mock Plaintiff when she noted the inappropriateness and legal irregularities of Spagnoli's budget expenditures," it said. Earlier this year NBC4 reported that three high-ranking officers sued the chief: Captain Mark Rosen and Lieutenants Renato Moreno and Michael Foxen. They claimed they missed out on promotions or professional advancement after they heard the chief and other officials use insensitive language to describe Jews, African-Americans, lesbians, Mexican-Americans, and Catholics. Many of those allegations were repeated in Lunsman's lawsuit. Several civilian employees also filed cases and made similar allegations about alleged racial discrimination, workplace harassment, and retaliation. A city spokesman declined to comment, citing the ongoing litigation, but relayed the written statement from the City Attorney, Larry Weiner. "The city is committed to maintaining a respectful work environment free from harassment, retaliation and discrimination and provides ongoing harassment prevention training to employees," Weiner's statement said. Spagnoli was hired in early 2016 and was directed to implement a series of reforms that had been outlined in a consultant's report prepared for the city. "She has been successfully addressing the recommendations of a 2015 report," the city's statement said. Rosen's lawsuit is the first to go to court. It's scheduled for a jury trial in November.